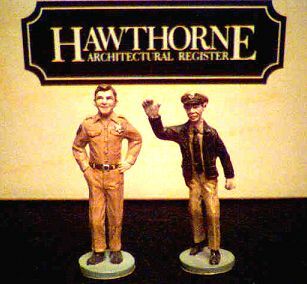 This is a pair of 2-1/4" tall painted metal die-cast figures of Mayberry Sheriff Andy Taylor and Deputy Barney Fife from the Mayberry Collection by the Hawthorne Architectural Register made in 1995. These were accessory pieces made to go with the Mayberry lighted village by Hawthorne. The two figures are very finely detailed and have great likenesses of our two favorite lawmen. Website design and hosting by Sohodojo Business Services. Item 17 of 466 items displayed in viewer. 0 items in cart.